Professor Vang speaks as part of the Washington County Lecture Series. Vang is one of the few Hmong full professors in the United States. 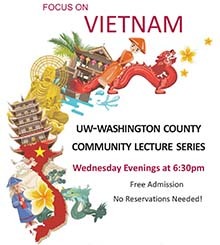 She will give the audience a broad overview of the history of Vietnam and how the country has developed and advanced over the past few centuries. The Friends of Matt Zillig sponsors the first lecture, as well as a social (featuring Asian food) immediately following. Matt Zillig is noted for having been committed to the concept of global citizenship. Read article about the event in the West Bend Daily News.